Freedom of religion is considered by many people and most of the nations to be a fundamental human right. In a country with a state religion, freedom of religion is generally considered to mean that the government permits religious practices of other sects besides the state religion, and does not persecute believers in other faiths. Freedom of belief is different. It allows the right to believe what a person, group or religion wishes, but it does not necessarily allow the right to practice the religion or belief openly and outwardly in a public manner. Ancient Jews fleeing from persecution in their homeland 2,500 years ago settled in India and never faced anti-Semitism. 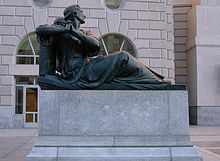 Freedom of religion edicts have been found written during Ashoka the Great's reign in the 3rd century BC. Freedom to practise, preach and propagate any religion is a constitutional right in Modern India. 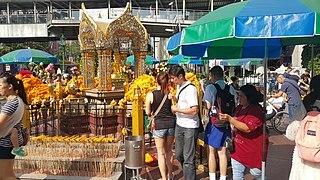 Most major religious festivals of the main communities are included in the list of national holidays. Freedom of religion in the Indian subcontinent is exemplified by the reign of King Piyadasi (304–232 BC) ( Ashoka). 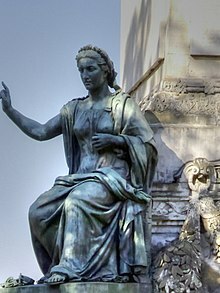 One of King Ashoka's main concerns was to reform governmental institutes and exercise moral principles in his attempt to create a just and humane society. Later he promoted the principles of Buddhism, and the creation of a just, understanding and fair society was held as an important principle for many ancient rulers of this time in the East. Freedom of religion in contemporary India is a fundamental right guaranteed under Article 25 of the nation's constitution. Accordingly, every citizen of India has a right to profess, practice and propagate their religions peacefully. Vishwa Hindu Parishad counters this argument by saying that evangelical Christians are forcefully (or through money) converting rural, illiterate populations and they are only trying to stop this. 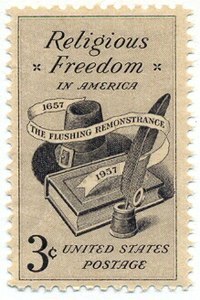 Freedom of religion was first applied as a principle of government in the founding of the colony of Maryland, founded by the Catholic Lord Baltimore, in 1634. Fifteen years later (1649), the Maryland Toleration Act, drafted by Lord Baltimore, provided: "No person or persons...shall from henceforth be any waies troubled, molested or discountenanced for or in respect of his or her religion nor in the free exercise thereof." 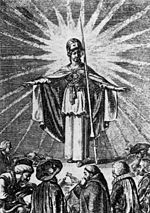 The Act allowed freedom of worship for all Trinitarian Christians in Maryland, but sentenced to death anyone who denied the divinity of Jesus. 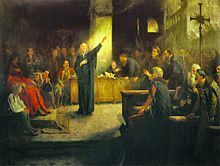 The Maryland Toleration Act was repealed during the Cromwellian Era with the assistance of Protestant assemblymen and a new law barring Catholics from openly practicing their religion was passed. 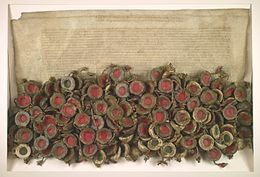 In 1657, the Catholic Lord Baltimore regained control after making a deal with the colony's Protestants, and in 1658 the Act was again passed by the colonial assembly. This time, it would last more than thirty years, until 1692  when, after Maryland's Protestant Revolution of 1689, freedom of religion was again rescinded. In addition, in 1704, an Act was passed "to prevent the growth of Popery in this Province", preventing Catholics from holding political office. 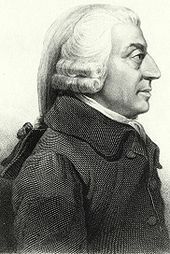 Full religious toleration would not be restored in Maryland until the American Revolution, when Maryland's Charles Carroll of Carrollton signed the American Declaration of Independence. Judaism includes multiple streams, such as Orthodox, Reform Judaism, Conservative Judaism, Reconstructionist Judaism, Jewish Renewal and Humanistic Judaism. 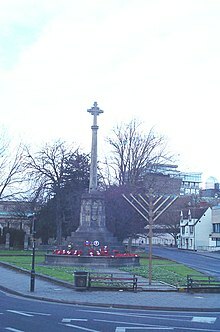 However, Judaism also exists in many forms as a civilization, possessing characteristics known as peoplehood, rather than strictly as a religion. In the Torah, Jews are forbidden to practice idolatry and are commanded to root out pagan and idolatrous practices within their midst, including killing idolaters who sacrifice children to their gods, or engage in immoral activities. However, these laws are not adhered to anymore as Jews have usually lived among a multi-religious community. The State of Israel was established for the Jewish diaspora after World War II. While the Israel Declaration of Independence stresses religious freedom as a fundamental principle, in practice the current[ timeframe?] government, dominated by the ultra-Orthodox segment of the population has instituted legal barriers for those who do not practice Orthodox Judaism as Jews. However, as a nation state, Israel is very open towards other religions and religious practices, including public Muslim call to prayer chants and Christian prayer bells ringing in Jerusalem. Israel has been evaluated in research by the Pew organization as having "high" government restrictions on religion. The government recognizes only Orthodox Judaism in certain matters of personal status, and marriages can only be performed by religious authorities. The government provides the greatest funding to Orthodox Judaism, even though adherents represent a minority of citizens. Jewish women, including Anat Hoffman, have been arrested at the Western Wall for praying and singing while wearing religious garments the Orthodox feel should be reserved for men. Women of the Wall have organized to promote religious freedom at the Wall. In November 2014, a group of 60 non-Orthodox rabbinical students were told they would not be allowed to pray in the Knesset synagogue because it is reserved for Orthodox. Rabbi Joel Levy, director of the Conservative Yeshiva in Jerusalem, said that he had submitted the request on behalf of the students and saw their shock when the request was denied. He noted: "paradoxically, this decision served as an appropriate end to our conversation about religion and state in Israel." MK Dov Lipman expressed the concern that many Knesset workers are unfamiliar with non-Orthodox and American practices and would view "an egalitarian service in the synagogue as an affront." The non-Orthodox forms of Jewish practice function independently in Israel, except for these issues of praying at the Western Wall. Islamic theologians[ who?] quote the Qur'an ("There is no compulsion in religion"[ 2:256] and "Say: O you who reject faith, I do not worship what you worship, nor do you worship what I worship...To you be your religion, and to me be mine"[ 109:1–6], i.e., Sura Al-Kafirun) to show scriptural support for religious freedom. Quran 2:190–194, referring to the war against Pagans during the Battle of Badr in Medina, indicates that Muslims are only allowed to fight against those who intend to harm them ( right of self-defense) and that if their enemies surrender, they must also stop because God does not like those who transgress limits. In Iran, the constitution recognizes four religions whose status is formally protected: Zoroastrianism, Judaism, Christianity, and Islam. The constitution, however, also set the groundwork for the institutionalized persecution of Bahá'ís,  who have been subjected to arrests, beatings, executions, confiscation and destruction of property, and the denial of civil rights and liberties, and the denial of access to higher education. There is no freedom of conscience in Iran, as converting from Islam to any other religion is forbidden. In Egypt, a 16 December 2006 judgment of the Supreme Administrative Council created a clear demarcation between recognized religions – Islam, Christianity and Judaism – and all other religious beliefs;   no other religious affiliation is officially admissible. 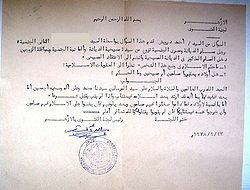 The ruling leaves members of other religious communities, including Bahá'ís, without the ability to obtain the necessary government documents to have rights in their country, essentially denying them of all rights of citizenship. They cannot obtain ID cards, birth certificates, death certificates, marriage or divorce certificates, and passports; they also cannot be employed, educated, treated in public hospitals or vote, among other things. See Egyptian identification card controversy. Among the most contentious areas of religious freedom is the right of an individual to change or abandon his or her own religion ( apostasy), and the right to evangelize individuals seeking to convince others to make such a change. Some Indian scholars  have similarly argued that the right to propagate religion is not culturally or religiously neutral. There are concerns about the restrictions on public religious dress in some European countries (including the Hijab, Kippah, and Christian cross). Article 18 of the UN International Covenant on Civil and Political Rights limits restrictions on freedom to manifest one's religion or beliefs to those necessary to protect public safety, order, health, or morals or the fundamental rights and freedoms of others. 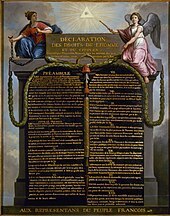 Freedom of religion as a legal concept is related to, but not identical with, religious toleration, separation of church and state, or secular state ( laïcité). The Pew Research Center has performed studies on international religious freedom between 2009 and 2015, compiling global data from 16 governmental and non-governmental organizations–including the United Nations, the United States State Department, and Human Rights Watch–and representing over 99.5 percent of the world's population. In 2009, nearly 70 percent of the world's population lived in countries classified as having heavy restrictions on freedom of religion. This concerns restrictions on religion originating from government prohibitions on free speech and religious expression as well as social hostilities undertaken by private individuals, organisations and social groups. Social hostilities were classified by the level of communal violence and religion-related terrorism. ^ al-Qattan, Najwa (1999). "Dhimmis in the Muslim Court: Legal Autonomy and Religious Discrimination". International Journal of Middle East Studies. University of Cambridge. 31 (3): 429–44. doi: 10.1017/S0020743800055501. ISSN 0020-7438.